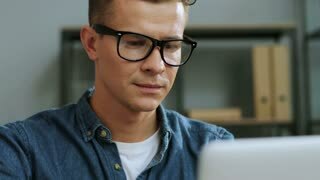 Close up portrait of serious young business man in classic shirt wearing glasses and working on the laptop in the stylish office. Close up portrait of serious young business man wearing glasses and working on the laptop in the stylish office. 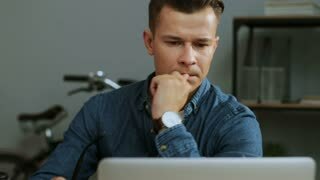 Close up portrait of thoughtful young business man wearing glasses and start working on the laptop on the office background. 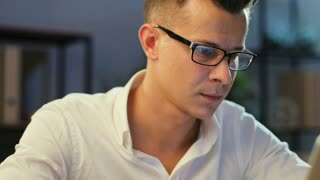 Close up portrait of young business man with glasses in the white shirt working on the laptop in the stylish office. Close up portrait of handsome young business man in the glasses working on the laptop in the stylish office. 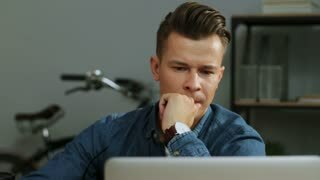 Close up portrait of handsome young business man wearing glasses and working on the laptop in the stylish office.